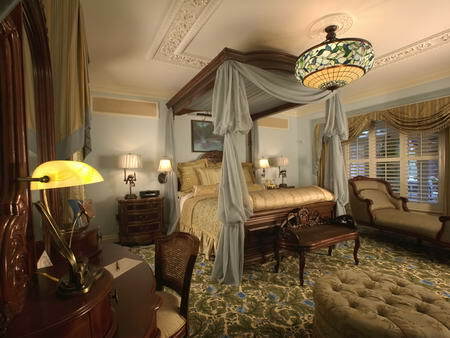 Many people wonder just how do you get to spend the night in the Disneyland Dream Suite? Is it possible to get a reservation for the Disneyland Dream Suite? Read on to find out some magical facts about this place in Disneyland that very few have ever seen. You can even learn how you can enter to win a stay in the Disneyland Dream Suite. They say that there are some things which money cannot buy and this is most definitely true of a Disney Dream Suite reservation. Disney likes some things to remain magical and exclusive which is why it is not possible to get a reservation for the Disneyland Dream Suite at any cost. The only way that you can get to spend the night there is to win it. 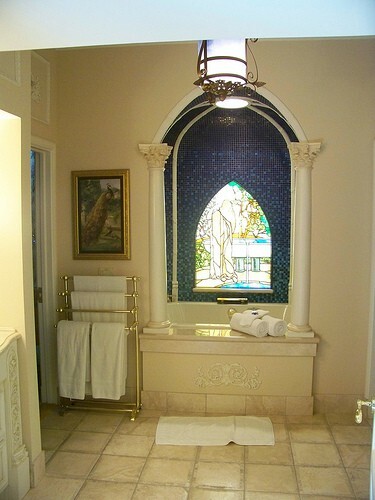 Although the Disneyland Dream Suite was only completed in 2008 it does have a very real connection to the ideas which Walt Disney had himself for the design of the suite. Walt Disney did have an apartment which he used frequently in Disneyland but this was located above the Fire Station on Main Street USA. When New Orleans Square was being designed and built in the 1960’s Walt decided that this would make a wonderful place for a new apartment for the family. 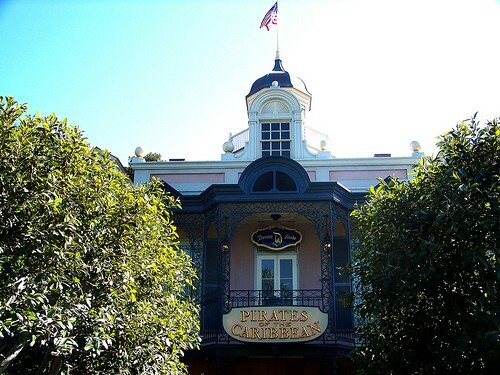 The perfect location was found just above the Pirates of the Caribbean attraction. 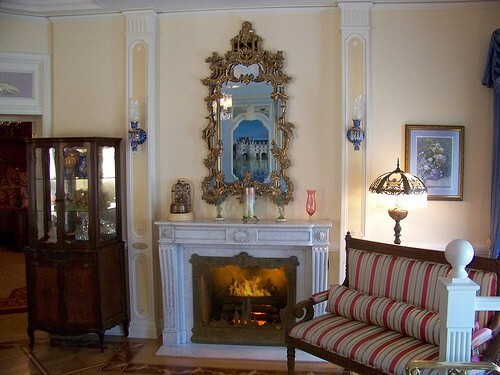 Walt Disney’s project for the new apartment was titled The Royal Suite and he brought in designer Dorothea Redmond who was known for her work on the set design of the movie Gone With the Wind for the original layout. For the interior design Walt chose his wife Lilly and Walt Disney Studios set decorator Emile Kuri to work together. With Walt’s untimely death in 1966 the project was put on hold by his brother Roy who simply did not have the heart to move on with the project. We understand that at the time the project was close to completion. From 1987 to 2007 the space was used for the Disney Gallery. It was announced in 2007 that the Disney Gallery space would be redesign and converted to the Disney Dream Suite. The design was true to the original and all the old drawings and concept details were used and adhered to as much as was possible. Instead of being an apartment for the Walt Disney family, this time the Dream Suite would be given away randomly as a prize. Much to the disappointment of many the Disneyland Dream Suite is not open for reservations at any cost. What is Inside the Disneyland Dream Suite? 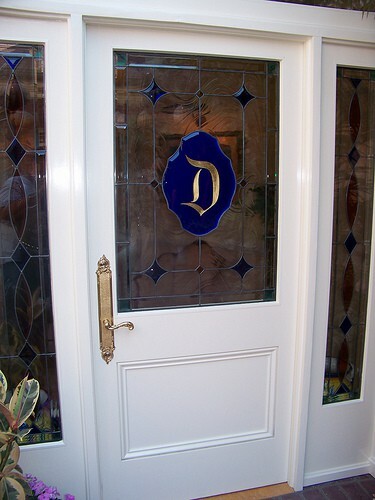 If you don’t know it is there then you may miss even the outside of the Disneyland Dream Suite. It is located above the Pirates of the Caribbean ride. A sweeping outdoor staircase leads up to the Dream Suite. There is also an elevator which you can see from the line just before you reach the indoor part of the line for the Pirates of the Caribbean Ride. The Dream Suite includes a living room, open air courtyard style patio, two bedrooms and two bathrooms. There is also an outside patio with a balcony which gives an excellent view over The Rivers of America The Disneyland Dream Suite is 2,600 square feet so much larger than the Cinderella Castle Suite at Disney World. As you would of course expect the attention to detail inside the suite is amazing. As you open the front door you arrive in the living room. The style of decor is exceptionally lavish and French Provincial/New Orleans style with a lot of Disney special touches thrown in for good measure. The center piece of the living room is a faux fireplace which has a fire guard with the outline of Sleeping Beauty’s Castle on the front. The flames behind it are meant to make guests think of the fireworks display in front of the castle. 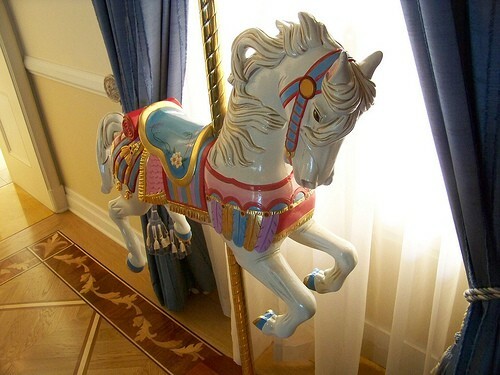 There is even a full size Carousel Horse which is of course reminiscent of the Fantasyland attraction in the park. 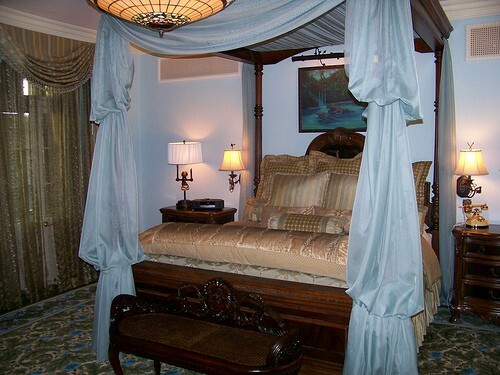 The decor of the Disneyland Dream Suite is of course ‘magical’ and each room has some kind of special ‘event’. In the living room the Grandfather Clock triggers Disney music from the park to play. The first bedroom is also known as the informal sitting room. This has very lavish dark colored heavy wood furnishings and two beds. The decor in this room is very much devoted to Walt Disney and the type of toys that he loved to collect (so of course you will see toy trains here on the shelves around the room). The original plans called for a stove to be in the room so of course the Imagineers installed one here. There is even a magical painting of Disneyland on the wall which miraculously transforms at night. The magical effect in the first bedroom is designed to be a child’s dream come true when the toys on the shelves and display cases spring into life. 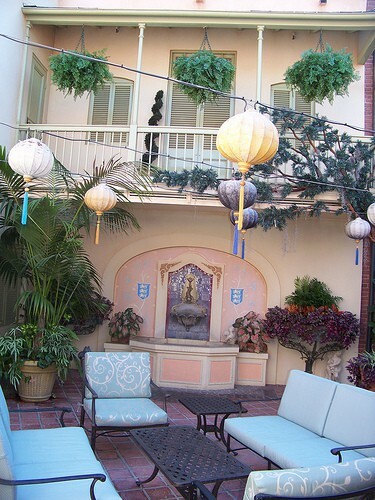 The outdoor courtyard patio is another beautiful space. Chinese lanterns light the patio at night and this is a beautifully quiet place to sit and relax. There is even a calming water fountain on the wall – look for the Disney family crest as a decor feature. The master bedroom and bathroom are perhaps the highlights of the suite. That lavishly decorated master bed is just beautiful! The decor here is described as Victorian with heavy dark woods but much lighter soft furnishings than in the other bedroom. There is also a very magical ‘goodnight kiss’ effect in the Master Suite. The room is transformed with twinkling star, the oil painting becomes animated and you will even see Peter Pan fly across the night sky. The Imagineers really made something very special for the Dream Suite guests. The Disney Dream Suite has a stunning master bathroom. There is a huge whirlpool tub which s set back in an enclosed alcove with a beautiful replica Tiffany panel of Aurora set into the wall. There is a night sky of twinkling stars above and surrounding the bath and of course the Disney magic is completed with the music which fills the room. There are huge ornate double sinks and a walk in wardrobe with plush bathrobes for guests to use during their stay. The balcony is the best place in the park to view Rivers of American and of course to watch Fantasmic! in the evening. 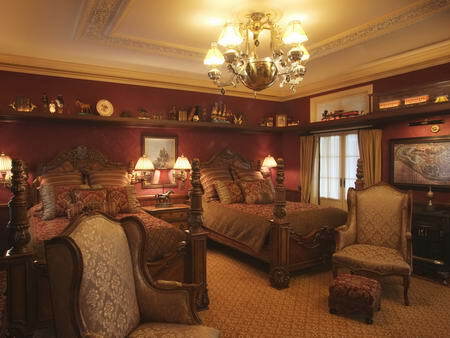 The only way that you can stay in the Disneyland Dream Suite is to win it as a prize. Disney does randomly give out nights at the suite (we always have our fingers crossed of course but not a lucky winner yet). But if you want to have a chance of winning a night in the Disneyland Dream Suite there are sometimes sweepstakes to enter. Remember to Like Us on Facebook to get up to date news about all the Disney parks and cruises!